This Saturday cannot come soon enough. 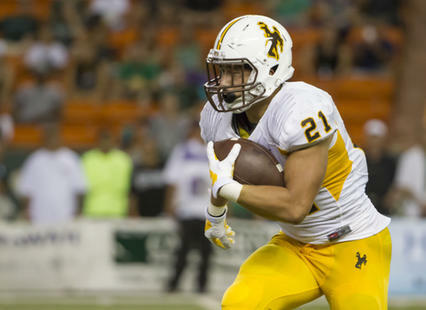 The University of Wyoming looks to bounce back from one of the worst losses in recent memory this week when the Eastern Michigan Eagles come into Laradise. Last week I told you to stay away from betting on the ‘Boys before even knowing the spread. They ended up being an 18 point favorite and lost. Miserably. I’m predicting that things turn around. The Cowboys are a 13.5 point favorite. If I were heading to Vegas, I’d put a little money is on the Pokes this week. Historically, week 2 matchups have been good for the Cowboys. In the past 5 years, in week two matches, they are 4-1 against the spread. They have covered the spread 2 of the 3 times that they were favored in such matchups. When Wyoming has been favored by double digits, they covered both times. The only “loss” came when they were 3 point favorites and ended up losing the game 31-34 against Toledo. A lot can change over the course of a year. Everybody knows that. One thing that looks to have remained the same is the Eagles ability to put up points, or lack thereof. During the 2014 season, they scored an average of 15.17 points per game in an inferior division. They were continuously gashed, giving up an average of 40.92 points per game. That’s a difference of over 25 points per game, nearly twice the 13.5 spread of this week. 2015 is a defining year for Craig Bohl and his team. As he looks for continuous improvement, expect a much better showing on both sides of the ball. That being said, the Cowboys should have no problem clicking offensively against a sporadic defense. Look for the Pokes to cover this week, bringing both their overall record and record against the spread to 1-1. Looking to bounce back from last week, Kentucky pulled off the win but let the Ragin’ Cajuns back into the game after having a 23 point lead. This week, I’m looking at Notre Dame. Notre Dame (-12.5) vs Virginia – I don’t quite understand how Notre Dame is only favored by 12 after trouncing Texas the way they did. Brian Kelly has them playing at a high level, not making many mistakes. I expect Dame to run away with this one.